Laura Kraut and Wish. Photos © Sportfot. Wellington, FL – January 10, 2014 – U.S. Olympic Team Gold Medalist Laura Kraut earned victory on day three of the 2014 FTI Consulting Winter Equestrian Festival (FTI WEF) competing with Stone Hill Farm’s Wish in the $6,000 Spy Coast Farm 1.40m jump-off class on Friday, January 10. Alexander Zetterman (SWE) and Canora also got their second win of the circuit in the day’s $6,000 Spy Coast Farm 1.40m Speed Challenge. Week one of the 2014 FTI Consulting Winter Equestrian Festival, sponsored by The Mar-a-Lago Club, runs through Sunday, January 12. The week’s highlights include the $75,000 Nespresso Battle of the Sexes on Saturday, January 11, as well as the $30,000 Mar-a-Lago Club Grand Prix, which will be held on Sunday, January 12. The FTI WEF, held at the Palm Beach International Equestrian Center (PBIEC) in Wellington, FL, features 12 weeks of world-class competition through March 30, awarding close to $8 million in prize money. In Friday’s $6,000 Spy Coast Farm 1.40m jump-off class, course designer Eric Hasbrouck saw 61 competitors with 26 advancing to the immediate jump-off in the International Arena at PBIEC. Fourteen entries were also clear over the short course, and Laura Kraut and Wish completed the fastest clear jump-off round in 38.669 seconds for the win. Kraut narrowly edged out fellow U.S. Olympic Team Gold Medalist McLain Ward, who finished second aboard Ramses du Lavillion in 38.885 seconds. Nicholas Dello Joio (USA) placed third aboard Nathalie de Gunzburg’s Fiego van de Zoneweide in 39.510 seconds. Emanuel Andrade (VEN) finished fourth with his time of 40.326 seconds riding Hollow Creek Farm’s Crossfire 10. Wish, an 11-year-old Dutch Warmblood mare by Numero Uno x Calvados, has been a top horse for young rider Jessica Springsteen, who trains with Kraut. Kraut is keeping Wish in top form through the beginning of the FTI WEF circuit and will continue to ride the mare until Springsteen arrives from school to compete during week three. Kraut has an exciting circuit lined up for this year’s FTI WEF with some of her returning top mounts as well as a few new horses. She finished tenth in Friday’s class aboard her newest mount, Andretti S, who she described as ‘a really interesting horse,’ and has high hopes for. Nouvelle will return to the ring for the first time since an injury in June. Kraut also looks forward to competing with her veteran partners Cedric and Jubilee d’Ouilly, who continue to excel at the top of the sport at 16 and 17 years of age. Kraut has a thriving business with a lot of great students and developing young horses as well this year, and she is excited for the season to come. A $6,000 Spy Coast Farm 1.40m Speed Challenge was also held on Friday with 41 entries and a win for Alexander Zetterman (SWE) aboard Canora. The pair also won the $6,000 Spy Coast Farm 1.40m speed class on Wednesday to kick off a great week of competition. They had the fastest of five clear rounds on Friday with a time of 68.352 seconds. Brittni Raflowitz (USA) and ESI Show Jumpers’ Elios placed second in 68.807 seconds. Leslie Howard (USA) and Jane Clark’s Whistler finished third in 70.544 seconds. Hunter competition for FTI WEF week one continued on Friday morning with the presentation of championship honors in the Camping World Adult Amateur Hunter 51 & Over Section A. Laura Lee Montross and Palm Meadow Farm LLC’s Nairobi Nights earned the division championship after placing first and second over fences on Thursday and earning second and third place awards over fences on Friday. Gina Day and Premier finished in reserve. The pair earned a third place ribbon over fences on Thursday and won the under saddle as well as one class over fences on Friday to conclude the division. Champion mount, Nairobi Nights, is a 12-year-old Dutch Warmblood gelding sired by Nairobi. 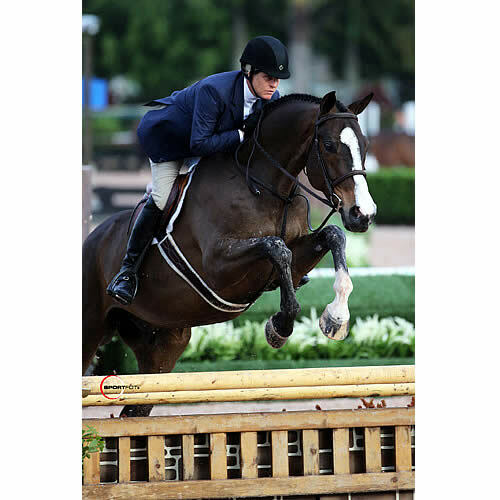 Laura Lee Montross has owned the gelding for seven years and has seen him develop and mature greatly over their years together. Montross trains with Jimmy Torano, who has helped her with Nairobi Nights since the beginning of their partnership. Montross, of Beford, NY, has been competing at the FTI WEF for ten years and owns a farm in Wellington where her horses live for the winter. FTI WEF week one, sponsored by The Mar-a-Lago Club, will continue on Saturday with the presentation of championship honors in the EnTrust Capital Small Junior Hunter 16-17 division in the E.R. Mische Grand Hunter Ring. The International Arena will host the $25,000 Suncast® 1.50m Championship Jumper Classic in the afternoon. The $75,000 Nespresso Battle of the Sexes will be the feature “Saturday Night Lights” event at 7:00 p.m. For full results, please visit www.showgroundslive.com.